It was Sunday and our plan was to go to St. Vitus to church. The lady at the hotel desk advised us to take tram 22 from the National Theatre which was several blocks away near the Elizabeth Bridge - the next bridge. We had a hard time finding a place to buy tickets. We finally found them at a nearby Chinese fruit store. 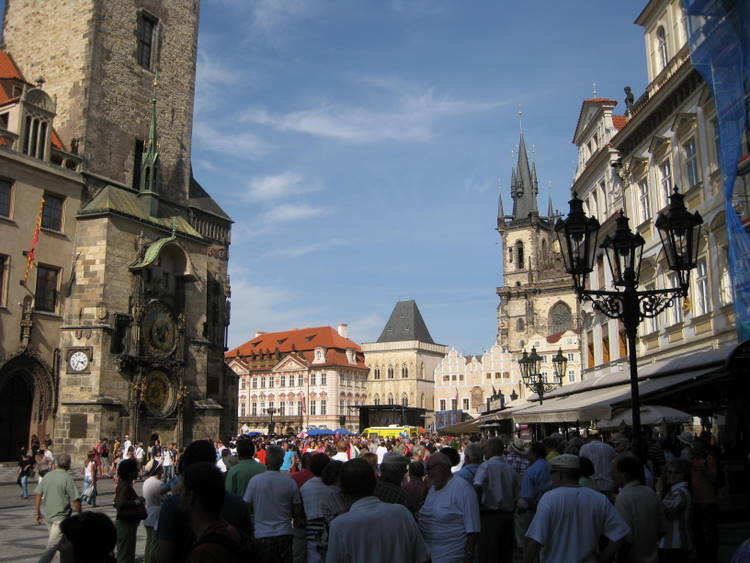 It has been our experience in Berlin and Prague and will be in other cities that most people have some type of long t erm pass as no one seems to put a ticket in the box on the bus or tram. We understand that if you get caught without this pass or putting a ticket in the box is a hefty fine. 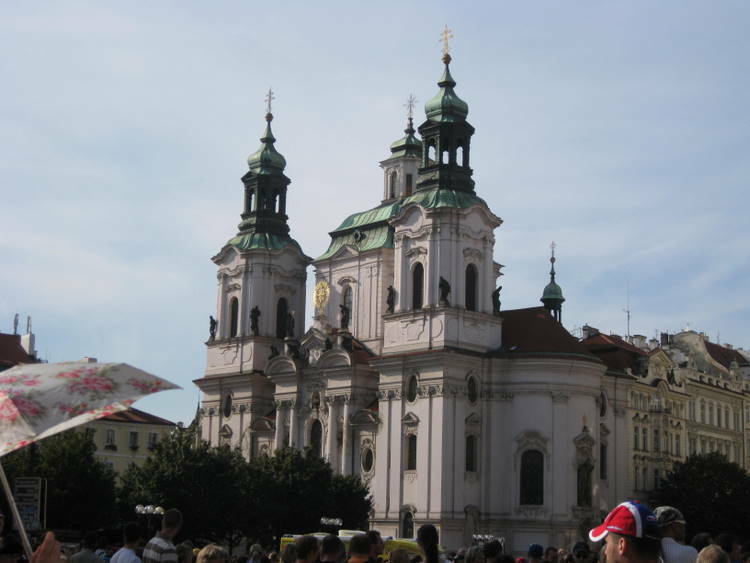 At 10:00 we took the tram up the hill across the river to the Prague Castle and St. Vitus church. 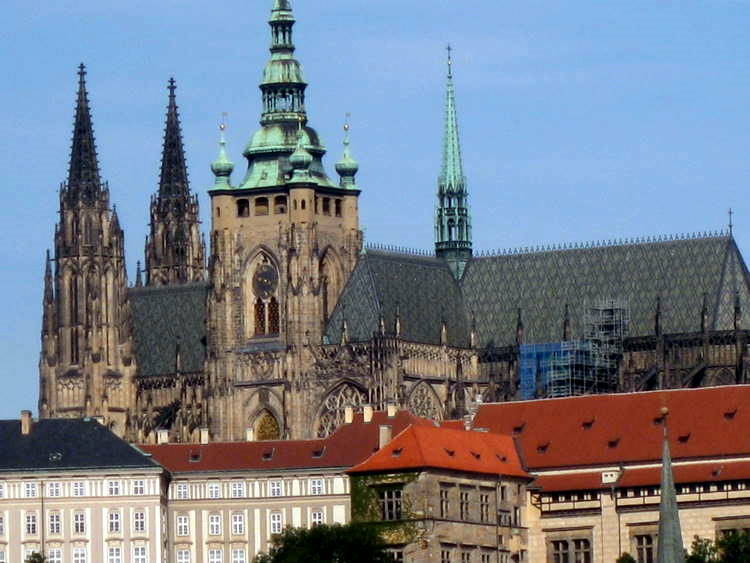 The Prague Castle which contains St. Vitus Cathedral stands high on a hill across the Vltava River from what is called Stare Mesto (Old Town) and Nove Mesto (New Town). 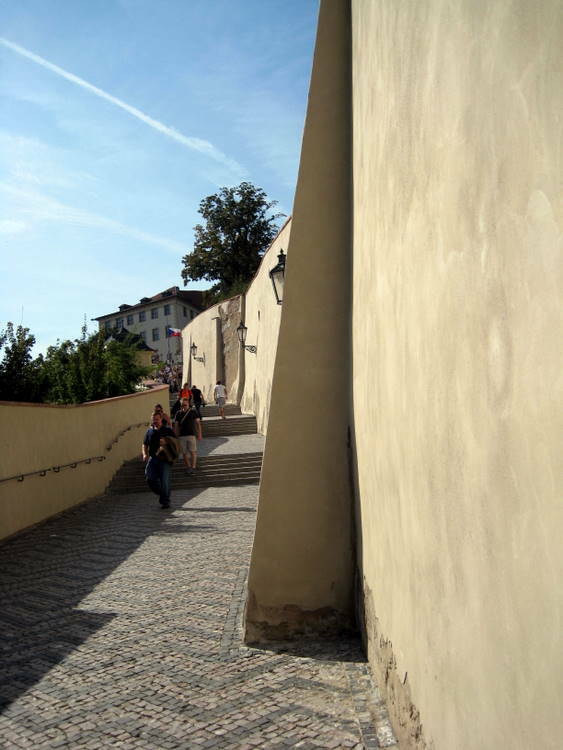 There are five major bridges across the river to this area known as Mala Strana (Lesser Town). 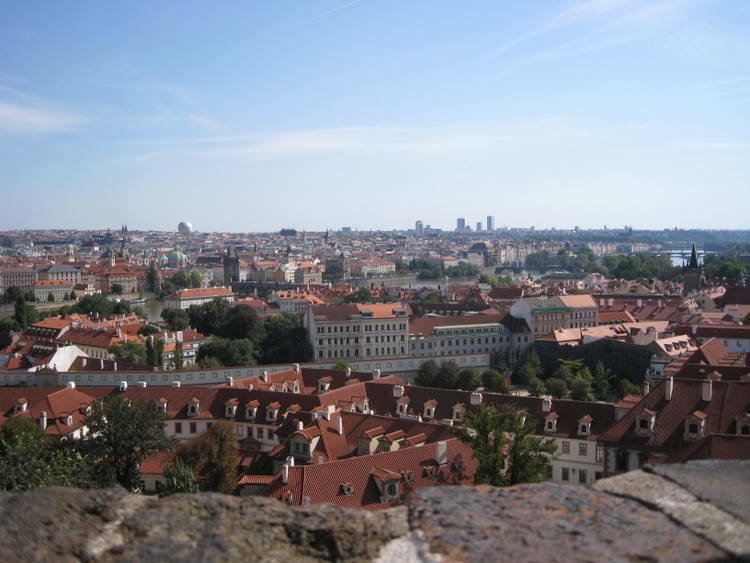 The Prague Castle was constructed by Prince Borivoj in the second half of the 9th century. It began as a wooden fortress and underwent four major reconstructions before reaching the present structure. 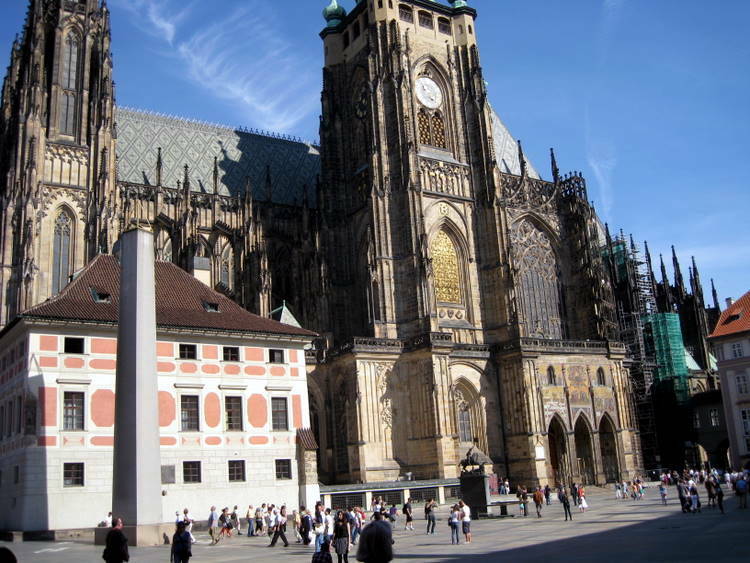 The largest development came in the 14th century when Charles IV made the castle his residence and ordered the building of St. Vitus Cathedral. Since each ruler made changes, the result is a wonderful mixture of architectural styles from Romanesque to Baroque. It is the largest castle in the world, measuring 1870 long and on the average 420 feet wide for a total of about 18 acres. The tram stopped near the entrance to the castle. There is no charge to go in the castle grounds, but there are charges to go into some of the major buildings. Our main goal was to make the 11:00 service at St. Vitus. We had time to walk around the outside before going in for the service. I took many, many pictures of the exterior as there were many very tiny little pinnacles on the SEE MODEL that I made. It was wonderful we see it in person and recall all of those tiny parts. 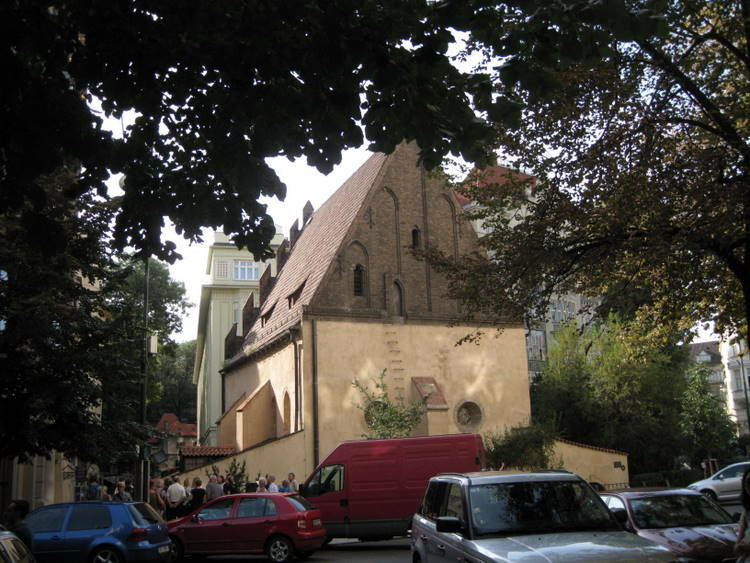 St. Vitus stands on the site of two earlier churches of the Prague bishopric – a pre-Romanesque rotunda built by St. Wencesias and contained his tomb. The second was a Romanesque basilica built by Prince Spytihnev II (1031-61). The foundation stone of the new cathedral was laid in 1344. 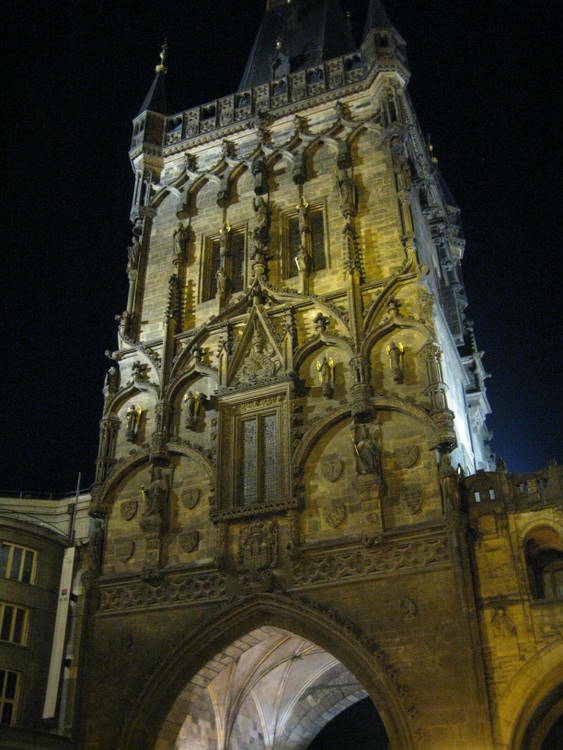 King Charles IV (1316-78) initiated and gave support to the construction and the costly furnishings of the new church. 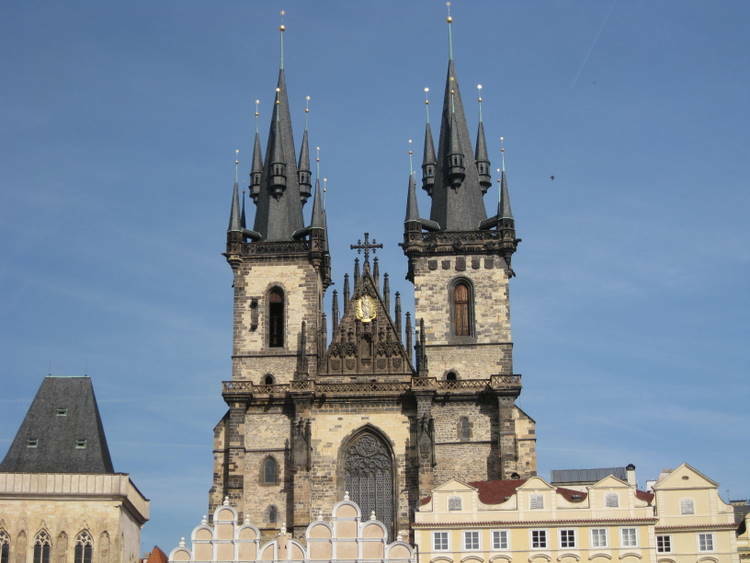 The Prague cathedral is one of last buildings of its kind. 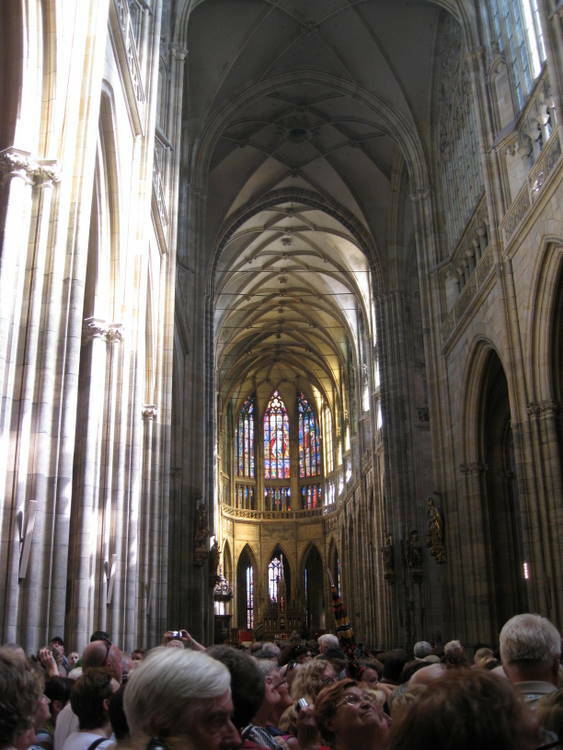 The decision to build a French Gothic cathedral in Bohemia called for much effort and expenditure. The first builder was Matthew of Arras who accomplished much by the time of his death in 1352. In 1356 Charles IV entrusted the building program to 23 year old Peter Parler who brought with him a team of experienced stonemason. Peter Parler died in 1399 and work was continued by his sons. In 1419 work on the cathedral ceased for a long period. During the Hussite revolution the rich furnishings and decorations were repeatedly plundered or vandalized. In 1421, the cathedral was plundered by not completely destroyed. Through most of the following centuries, the cathedral stood only half-finished. It was built up to the level of the great tower and a transept. Several attempts to continue the work on cathedral were mostly unsuccessful. 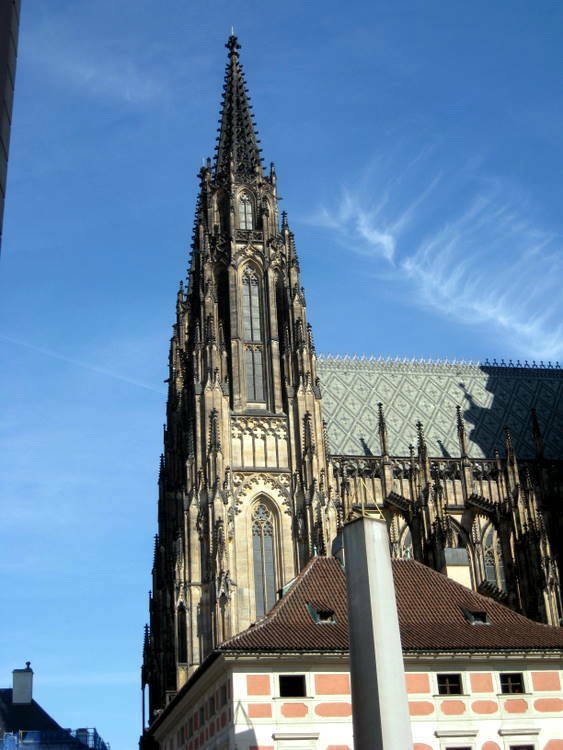 In the latter half of 15th century, King Vladislav Jagiello commissioned Renaissance-Gothic architect Benedict Ried to continue the work on the cathedral, but almost as soon as the work began, it was cut short because of lack of funds. Later attempts to finish the cathedral only brought some Renaissance and Baroque elements into the Gothic building. 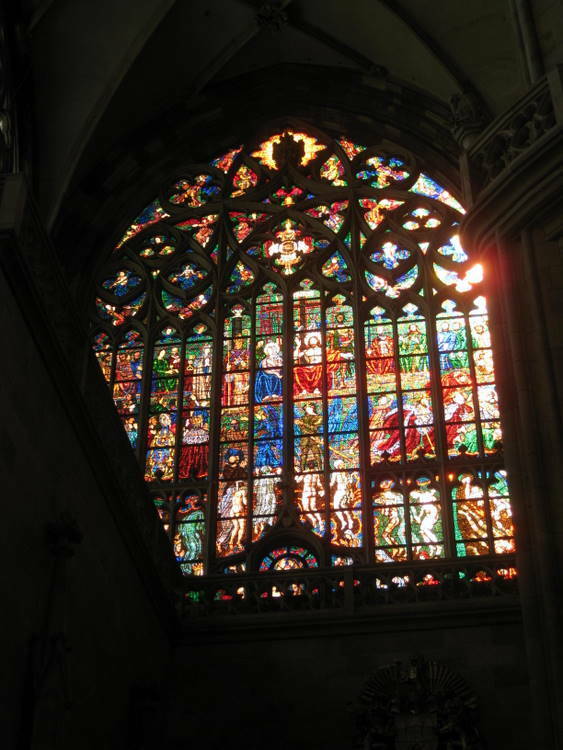 In 1844 a society, "Union for Completion of the Cathedral of St Vitus in Prague" was formed, whose aim was to repair, complete and get rid of "everything mutilated and stylistically inimical". Josef Kranner was heading what was mostly repair work from 1861 to 1866, getting rid of Baroque decorations deemed unnecessary and restoring the interior. In 1870 the foundations of the new nave were finally laid, and in 1873, after Kramer's death, architect Josepf Mocker took over the reconstruction. 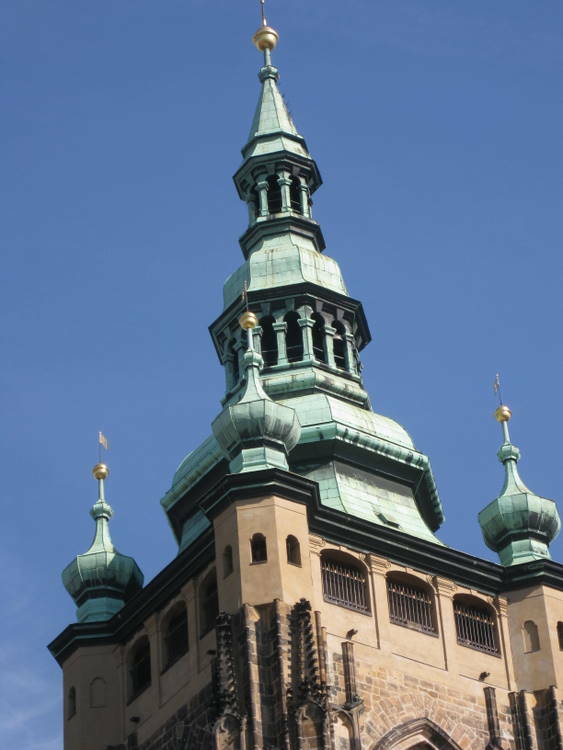 He designed the west facade in a typical classic Gothic manner with two towers, and the same design was adopted, after his death, by the third and final architect of restoration, Kamil Hilbert. 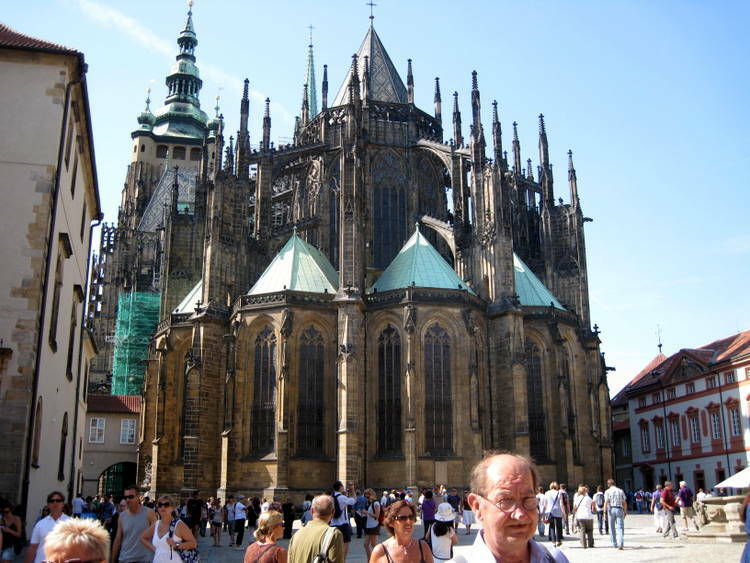 In 1929, the St. Vitus cathedral was finally finished, 600 years after it was begun. Despite the fact that entire western half of Cathedral is a Neo-Gothic addition, much of the design and elements developed by Peter Parler were used in the restoration, giving the Cathedral as a whole a harmonious, unified look. The guards allowed us in St. Vitus for the service. Other visitors had to wait until noon. We went right to the first row. Of course it was a Roman Catholic and entirely in Czech. We didn't understand a word but we know the various parts. We were able to add our own En glish words. After the service we spoke to the couple behind us. They had lived in Czechoslovakia under the communist. Now they lived in Alaska. They sent us a greeting this Christmas. I took a lot of pictures inside. 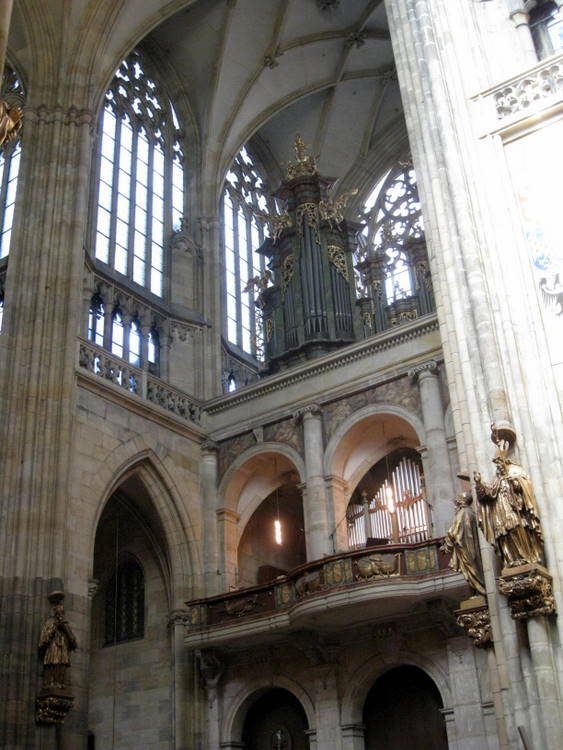 Over the main altar was a painting of St. Vitus and the Virgin Mary painted in 1673. 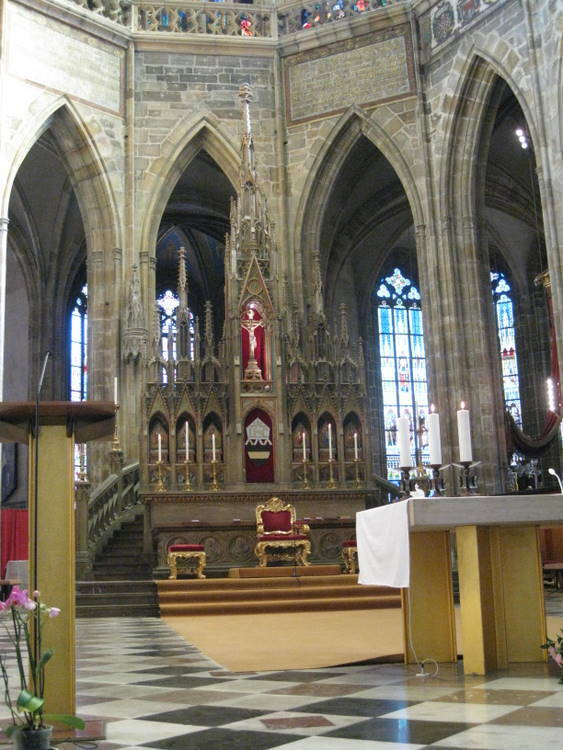 In front, the main altar was a free standing altar made of upright “I” beams, painted gold as legs. The pulpit, although there was a beautiful tradition pulpit on the side wall, was a taller “I” beam with a simple wooden desk. There were beautiful stained glass windows in the clerestory. At the end of the service, the organ gave a very beautiful and loud postlude. 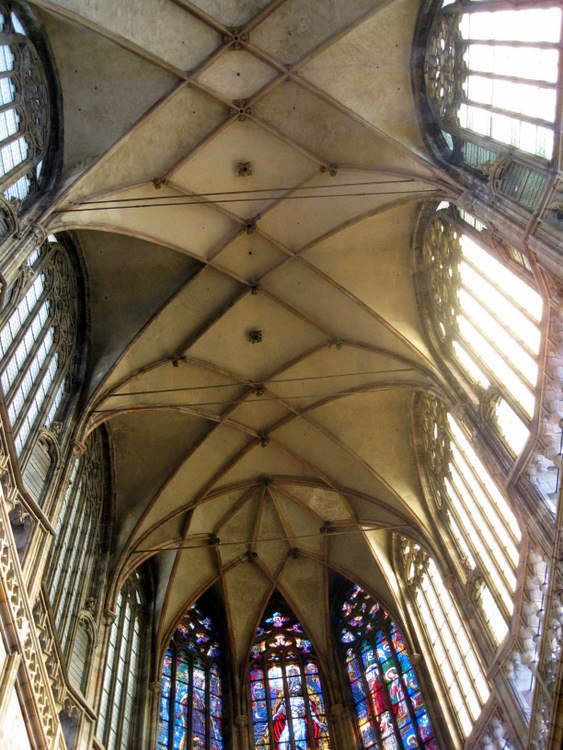 We could walk in the ambulatory where they were splendid baroque altars and a lot of stained glass. In the south trans cept was a magnificent red window. Further in the nave were amazingly colorful large windows. Since the service was over, a very large crowd had gathered in the west end for a visit. An iron railing separated them from the nave. Only a small group at a time was allowed in. Some of the areas that we had visited after the service were now closed off. The chapel of St. Weneceslas, which contains many jewels and the tomb of Weneceslas are closed to the public. We found an outdoor café behind the cathedral. I had a chicken wrap and my wife had a tuna roll. It was rather crowded so we invited two men to sit with us. One was from Germany and his friend from Chile. They spoke excellent English and we had a good conversation. 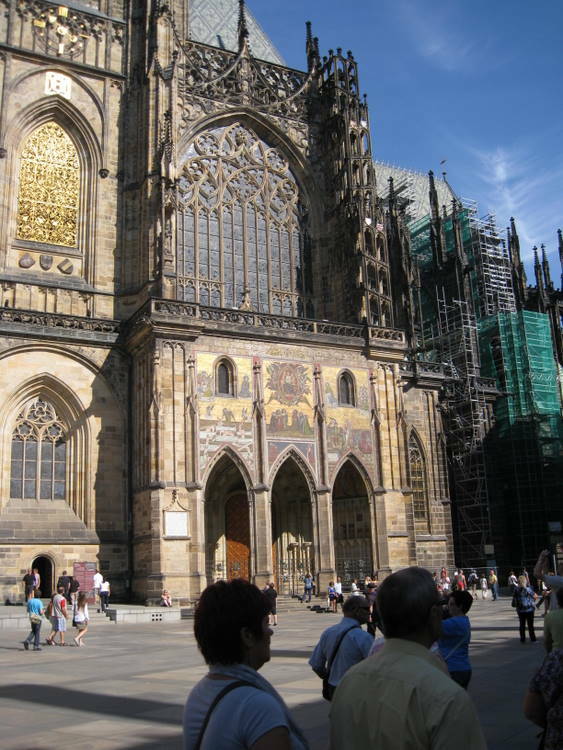 We went in to the gift shop and bought a book on St. Vitus cathedral and one on the castle. We wanted to visit the main points of interest. You had to purchase a combined ticket. We had seen the cathedral for free as we attended the service. We were told that ST.GEORGE'S CHURCH behind the cathedral was closed. The only other attraction was the castle museum and a street with colorful houses. You could not buy separate tickets and since we had seen the cathedral and St. Michael’s was closed, we didn’t buy a ticket. After exploring more of the castle area on the outside, we decided to walk back down to the Charles Bridge. At the top of the steps were several observation areas. It was a beautiful day and the view of the area across the bridge was spectacular. There were many, many steps but it wasn't too bad as there would be about five steps and then a ramp, five more steps and another ramp. At the bottom, we crossed over another bridge into the old town. We walked several blocks and came to the Old Town Square. On the left was a beautiful, large white Baroque church- ST.NICHOLAS It was built in 1735 as part of Benedictine monastery which no longer exists. It has a high central cupola and two slim towers on the southern side. We went in. It was very ornate, but not too large. It has an extended central nave on a cruciform plan. There is a deep chamber under the choir and a semicircular presbytery or apse. They were advertising at concert for 5:00 and another at 8:00. They looked good, but we had a dinner reservation at 7:30. Today in a Town Square in front of the Church of our Lady behind the Tyn were thousands of people attending a memorial for three Czech hockey players who died this week when a Russian plane crashed and killed almost all of the players. The crowd had periods of silence, then there speeches, some music and the ringing of church bells. We didn’t know what was happening as we have missed a lot of news in the ten days we have been on the road. Later someone told us. 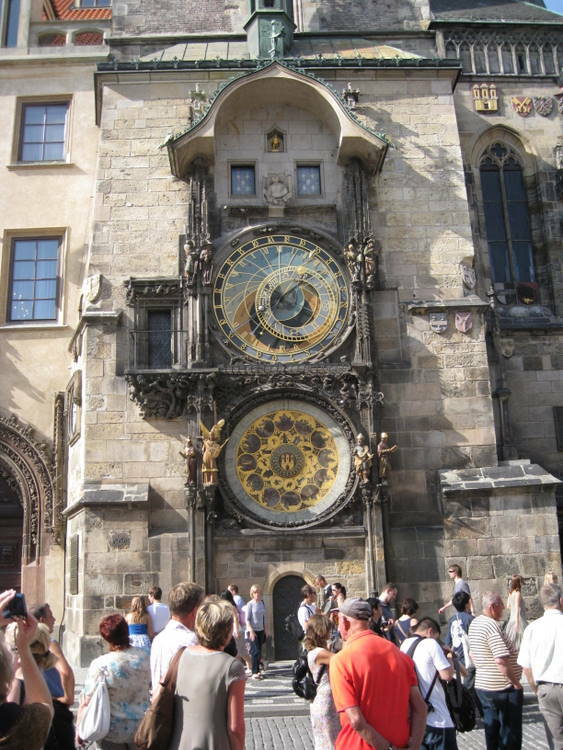 Also in the square was the famous Astronomical Clock - SEE MODEL . The clock was built as part of the Town Hall in 1490. The clock is very intricate and consists of three parts. There is an astronomical dial showing the position of the sun and moon in relation to the zodiac. Secondly there is a calendar dial with medallions representing the months of the year. The third part is the Walk of the Apostles where wooden statues appear from trap doors and move from left to right while a skeletal figure signifying death pulls a rope to the rhythm of the chimes. We decided to hang around to hear it strike 4:00. In the meantime we went a beautiful crystal shop. My wife wanted one of each of the glasses and bowls. The clock struck 4:00 with music, moving figures and bells. It was a lot of fun to see. We tried to go in OUR LADY BEFORE THE TYN church but they were having a mass for the hockey players. The church is a Gothic building with unique towers which are capped by four small spires. 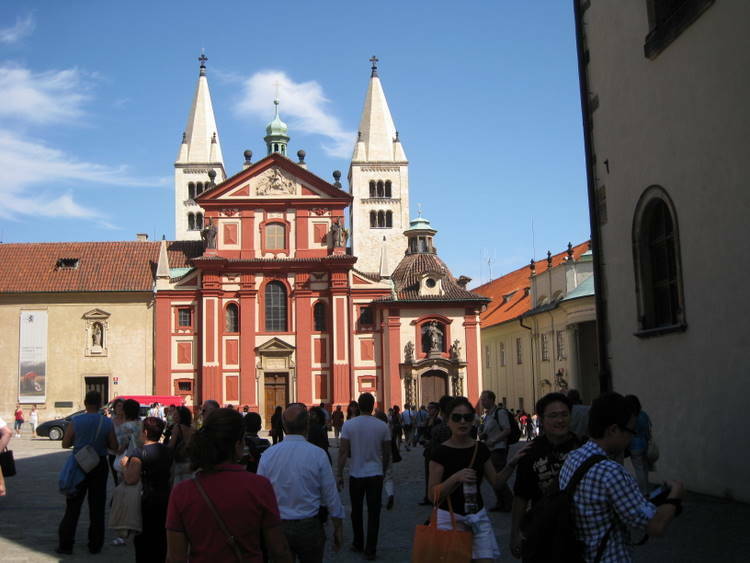 The church was founded in 1385 during the reign of Charles IV. The church is separated from the square by a school which was built directly in front of it. Before making this trip, I had sent emails to a number of churches asking permission to take photo if they didn’t ordinarily allow them. Most churches didn’t respond. I did hear from this church, who wanted to charge me $100 to take interior photos. I wrote back explaining I wasn’t taking them for any profit. They wrote back and wanted $50.00. I said “forget it”. We walked through a beautiful area with fancy stores, Gucci, Hermes, Cartier etc. to the OLD/NEW SYNAGOGUE which is one of Prague’s oldest buildings. It was built in 1270 in a Gothic style and said to be Europe’s oldest active synagogue. Over 700 years of continuous prayer has occurred there except during the Nazi occupation. Men were given little cloth kippah to wear on their heads. The nave was a large room with six bay over by a five part ribbed vault. In the center of the hall is a pulpit, separated by a Gothic grill from the 15th century. The Holy of Holies at the eastern wall has Renaissance pilasters and the original Early Gothic pediment. It was very interesting. No photography was allowed. I have a model to make of the synagogue and the Astronomical Clock. After a stop for a drink in the Inter Continental hotel where my wife stayed about 23 years ago when was she working in Germany, we walk along the river back to our apartment for a little rest. Out again back to the area of the historic Old Town Square for dinner at the the Sarah Bernhart Restaurant which was located in the Paris Hotel around the corner from the Powder Tower. We stopped to take photos of the Powder Tower. The restaurant was a beautifully appointed art nouveau space decorated by art deco fixtures, in-laid wood paneling, and gilded stucco work. We could not order a cocktail. They said they had a bar but did not serve anything but wine in the dining room. The menu offer many delights. We had foie gras and camembert cheese for starters. I had lamb chops and my wife duck confit. We shared a bottle of wine. For dessert we had crème brule –two different flavors. We had a very good meal. We walked back to the Old Town Square. 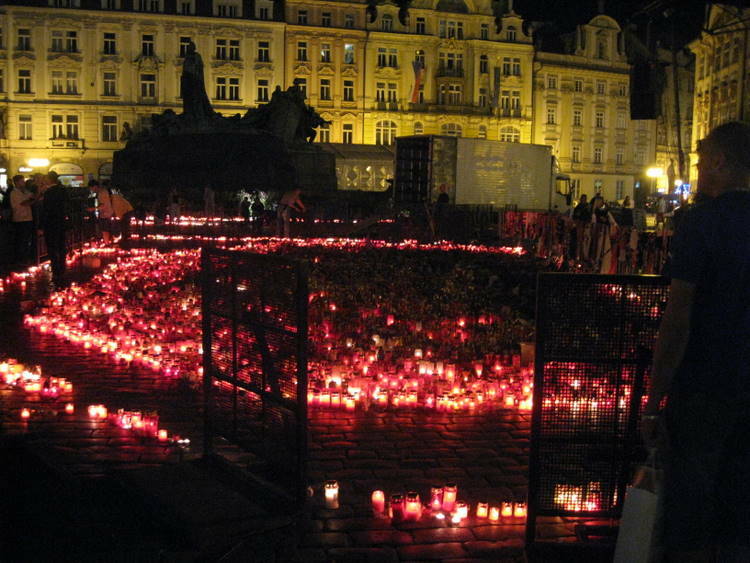 In front of Our Lady before Tyn there were hundreds of red votive candles burning as a memorial to the hockey players. The entire square was beautifully lit. This is our last night in Prague. We wish we had more time as there are still a lot of things we wanted to see. 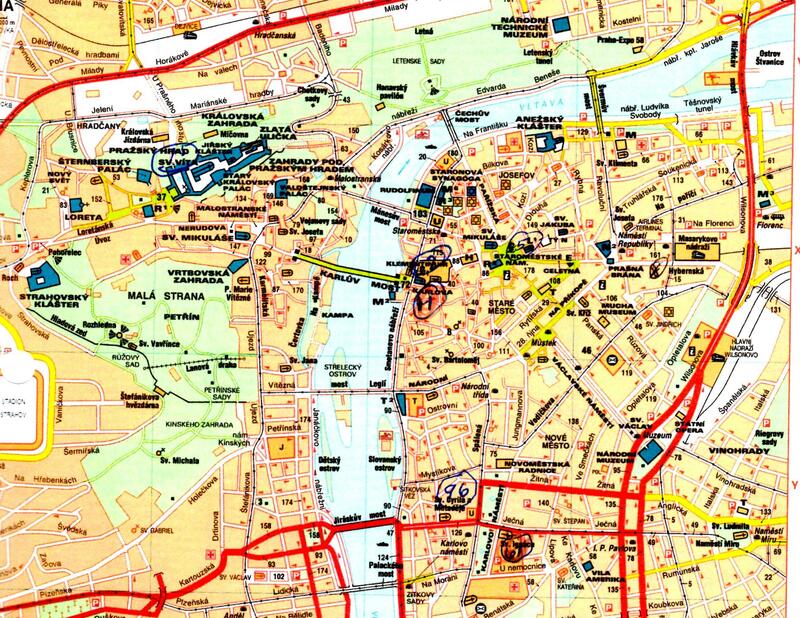 We leave tomorrow for Brno on our way to Budapest.